Today is my friend Ruby’s birthday and since she doesn’t live close enough for me to cook her a birthday meal, I told her she could pick today’s recipe for Pinch My Salt. She chose a curry rice salad with artichokes that she says my mom used to make. I have a vague recollection of the salad, but I think it must have had some ingredients I don’t like because I don’t remember eating much of it. But, since it’s Ruby’s birthday, I decided I could create a curry rice salad that we would both enjoy! The problem is that I don’t have the exact recipe for the salad Ruby remembers. 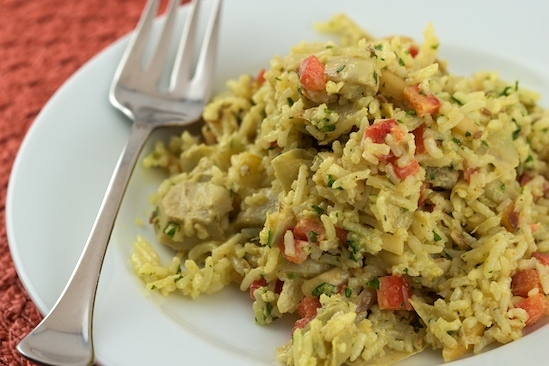 There are tons of curry artichoke rice salad recipes out there and many of them start with a box of chicken-flavored Rice-a-Roni. I knew I could come up with something better than that, so I’ve been working on a new version of the salad for a couple of days. What Ruby likes best about the original salad is the combination of creamy mayonnaise, curry powder, rice, and artichoke hearts. She left the rest of it up to me. I decided to keep the recipe simple, but opted to make a homemade curry mayonnaise rather than use mayonnaise from a jar. Making the mayonnaise from scratch doesn’t add any extra time to the recipe because it can be made while the rice cooks, but it adds tremendously to the flavor! Rather than start with a box of flavored rice, I used plain basmati and cooked it with butter, cumin seeds, and chicken broth. Rice cooked this way is delicious enough to eat plain, but is also a great base for the salad. When the rice cooled I added the curry mayonnaise, chopped artichoke hearts, and toasted almonds. It tasted delicious but definitely needed some color. Fresh chopped parsley and some chopped red bell pepper added the color and complimented the curry flavor well. My husband and I have really enjoyed eating the salad for the past couple of days, and I hope Ruby likes it too! Hopefully we’ll be able to get together after Thanksgiving to cook and celebrate both of our birthdays (they’re only a week apart). I requested a pumpkin roll! 1. Put rice in a mesh strainer and rinse well under running water, swishing it around for a few minutes. Drain well. 2. In a small saucepan, melt butter over medium-high heat. Add cumin seeds and stir for a few seconds. When seeds have darkened and are fragrant, add rice and cook, stirring constantly, until the rice grains have turned opaque and a few of them are just starting to brown. Add chicken broth, stir, and let come to a boil. Turn heat down to low, cover pot and let simmer undisturbed for 20 minutes. Remove from heat, fluff rice with a fork and pour into a large bowl. Allow to cool. 3 While rice is cooking and cooling, make the mayonnaise, chop the vegetables, and toast the almonds. 4. When rice has cooled, stir in the artichokes, almonds, bell pepper, parsley and curry mayonnaise. Cover and refrigerate until ready to serve. Recipe Notes: *I prefer the Cara Mia brand of artichoke hearts. **To toast almonds, heat a skillet over medium heat. Add almonds and stir until fragrant and lightly browned. Remove from skillet immediately and let cool. If you really don’t want to make the mayo from scratch, use one cup of good quality mayonnaise and whisk in one tablespoon curry powder, 1 teaspoon brown sugar, and 1/8 teaspoon cayenne. To turn this salad into a meal, add one or two cups of cooked shredded chicken. Would also be good with leftover turkey! In a medium bowl, whisk together egg yolk, lemon juice, vinegar, mustard, and salt. Start adding oil, a few drops at a time, whisking continuously, until you’ve incorporated about 1/4 cup of the oil. Add remaining oil, still whisking continuously in a slow, steady stream. Mayonnaise should be thick and creamy. Whisk in curry powder, brown sugar, and cayenne. Refrigerate until ready to use. Recipe Notes: *Raw egg is not recommended for infants, the elderly, pregnant women, and people with weakened immune systems. To avoid the risk of salmonella infection, you can use pasteurized egg yolk instead. But, I’ve always just used regular fresh eggs from the grocery store. Thank you Nicole, this is very special to me! It looks wonderful, can't wait to celebrate our birthdays! This is my favorite salad that your mom used to make! Good choice Ruby! This post definitely made me smile. I'm so glad u remember it Corinne! If you can find them, use eggs that have been pasteurized in the shell. Great fresh taste and no worries about salmonella. Happy Birthday, Ruby! A homecooked meal is a wonderful birthday gift. I hope you can get together for a real meal sometime soon. I have a similar rice salad recipe that was asked for so much that I put it in a cookbook! Mine uses one box of chicken Rice-A-Roni, mayonaise, curry powder, marinated artichoke hearts, a couple of sliced green onions and sliced water chestnuts. I love it. I think I will add the diced red pepper like you did. It gives it a nice look and I'm sure the flavor will be even better. THANKS! Wonderful recipe. Should the last ingredient be cayenne pepper? I love cayenne pepper and use it almost daily. It definitely adds a little "kick" to curry as well as other dishes.This is a nice site. I appreciate the tremendous recipes found here. I appreciate the hard work in putting it together.Best, Glenn R.
This recipe is absolutely amazing. I've made it twice in 5 days. The first time, I was out of canola oil and used olive oil for they mayonnaise; it yielded a much heartier flavor. However, it did not overwhelm the beautiful cumin and basmati rice. I also added chicken and cilantro to experiment, but still, the flavors were never compromised. Delicious! I have the same recipe however, my calls for Ice Berg lettuce in small bite size pieces and I use the artichoke oil as well as a smallamount of mayo with the curry. Yummy sald. Wonderful recipe. We are vegan so I cheated and used Just Mayo brand mayo, it is a plant based mayo that tastes like the real thing. I also added some fresh sauteed onions and garlic. Yum!